Do you peel and devein your own shrimp, or buy them already shelled, cleaned and ready-to-use? I must admit that I generally go the convienence route here. About 50% of my Butchery class in culinary school was peeling and deveining shrimp, and I got kind of worn out with that task during my time there. It wasn’t that it’s a particularly complicated or difficult task, it’s just that the Butchery class was in charge of cutting and preparing all of the meat and seafood for all of the classes in the school, and the school went through a lot of shrimp. So, I was assigned that lovely task pretty much every single day. Peel, devein, complain, repeat. So now, I generally opt for the lazy-man’s route at home, and buy it ready-to-cook. However, when I was sent a 5-pound bag of beautiful, HUGE shrimp for the Shrimp Showdown, they were shell-on. Luckily, it also came with a sweet shrimp cleaning tool, which I’ve become very close friends with over the past few months. I vowed to use up all 5 pounds of that shrimp before it got all freezer-burned and gross, and by golly, I did! I was a peeling and deveining maniac for a few months there, and I’m a better person for it. I guess. “When in doubt, make crostini” should definitely be one of my life’s mottos. 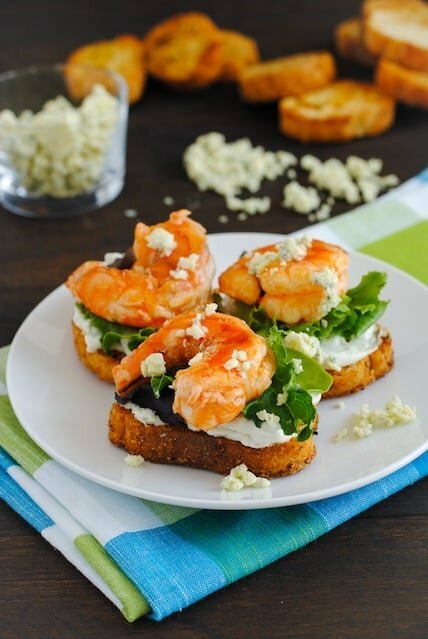 When using up the last few shrimp in the freezer, it’s definitely a good time to make buffalo shrimp crostini. I toasted up some bread slices and topped them with greens and a quick 4-ingredient spread made with Salemville Amish Blue Cheese. Then, I gently sauteed the shrimp and finished them with buffalo sauce and perched those on top. 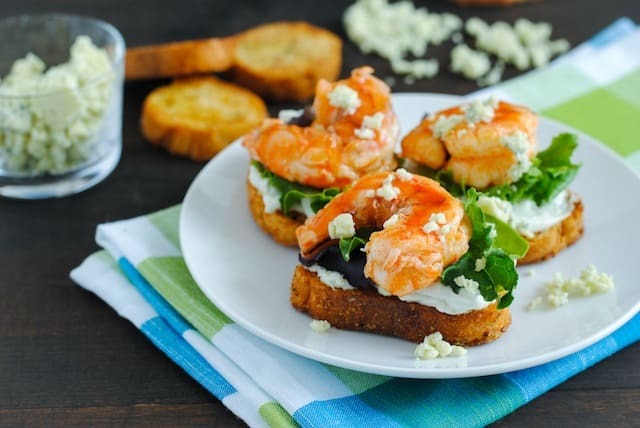 Do you have a great recipe that uses blue cheese? 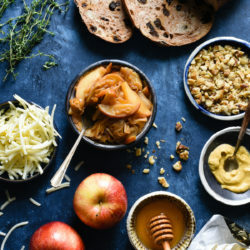 Salemville is inviting home chefs to enter their favorite recipe using Salemville® Amish Blue cheese for a chance to win 1 out of 9 cooking prizes. The amazing prizes include a Le Creuset® 6-piece Signature Cooking Set and Kitchen Aid® 5-Quart Artisan™ Stand Mixers! Enter the contest through the “How Do You Blue?” app on Salemville’s Facebook page or through their website: www.salemville.com. Preheat oven to 350 degrees F. Place baguette slices on rimmed baking pan and spray with cooking spray. Bake 8 to 10 minutes or until crisp, turning once. Meanwhile, use mixer to whip cream cheese, blue cheese, lemon juice and pepper until well combined and fluffy. Heat oil in large skillet over medium heat. Add shrimp and cook 4 to 6 minutes or until opaque and cooked through; stirring occasionally. Remove from heat and stir in buffalo sauce. 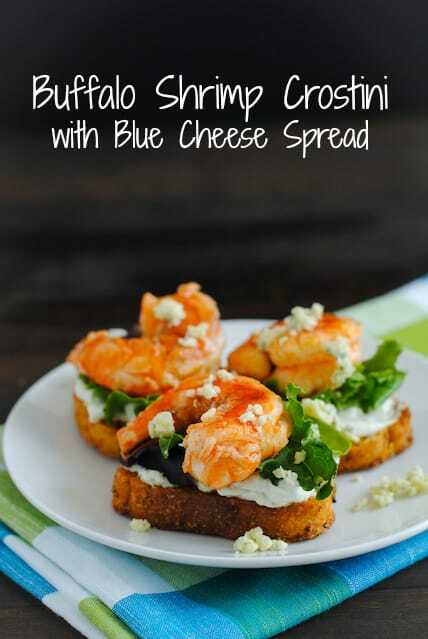 Spread blue cheese mixture on crostini; divide mixed greens over crostini. 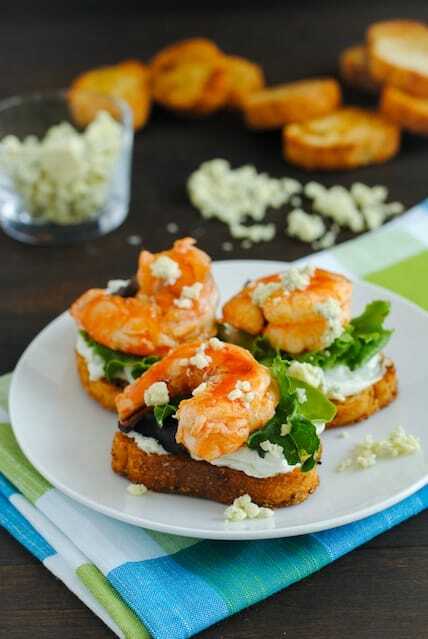 Place 1 shrimp on each crostini and garnish with additional blue cheese, if desired. Serve immediately. 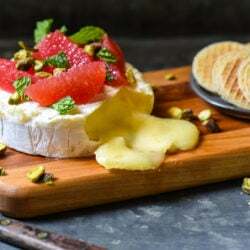 Disclaimer: This post is part of a relationship I have with Saputo Specialty Cheese for recipe development. Posts like this help me pay for the costs associated with this blog (groceries…lots of groceries), and help support me as I pursue a career in recipe development and food photography. All opinions are 100% my own. What a great idea for an appetizer…thanks for sharing! You’re welcome, Jodee! Thanks for stopping by. I love these! They’re perfect for a cocktail party I love the colors and flavors! Bookmarked this one for the next time I buy shrimp. 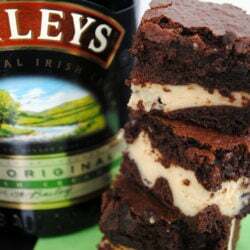 Buffalo and Blue is in my top five flavor combinations, and this looks like an incredible recipe. I love the idea of dressing up and making something a little more fancy with buffalo sauce. Heck yes! I’m all about taking comfort food and making it a bit classier. Thanks Sophia! I’ll make the crostini, you bring the drinks, Hannah. We’re all set! Exactly, Valentina. If the peeled and deveined are way more expensive, I’ll do the work myself. But it’s usually about the same, or just a little more expensive. I’m lazy! haha.